•	This software logs all the pressed keys, both typewriters as well as system keys. •	It is able to log the clipboard content and started applications as well. •	It can take screenshots and allows you to adjust the period. •	It can log all the visited websites on all browsers except Safari. •	This is hidden software. The average user of a PC cannot find it easily. Total Spy uses the process of tsmon.exe for its purposes. In order to find it, you should use COVERT Pro monitors. If the process does not hide itself in the system, then it can be seen using the monitor of System processes. 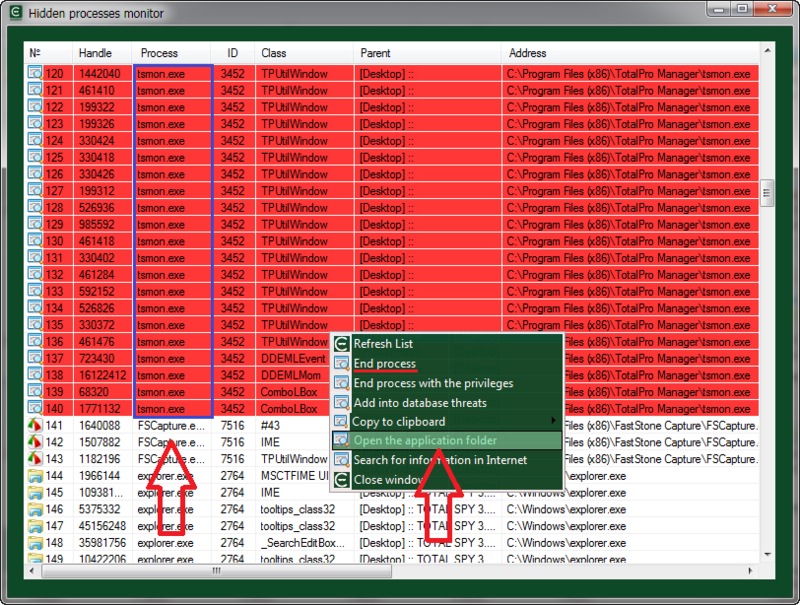 If spyware is hidden, then you should open the monitor of Hidden processes. It shows all the processes that hide themselves from the system. They will be highlighted in red. After detecting spyware on the computer you should end the process tsmon.exe. 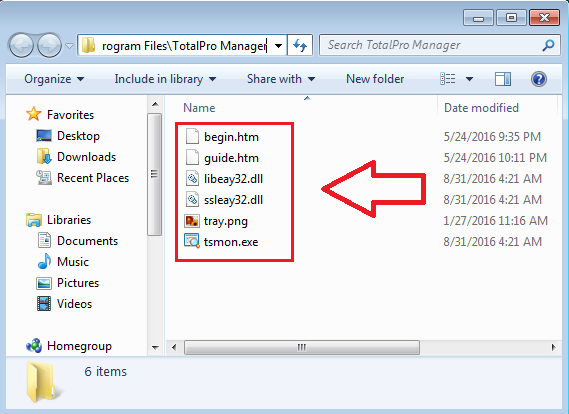 Then open the folder where this program is installed (using the context menu which appears after click on the right mouse button) and delete its contents. You can safely work at your computer without deleting Total Spy. For this purpose, all the actions that you want to hide from the spy, you will need to perform in the secure platform. This keylogger will record everything outside of the platform and the person who installed Total Spy will see it. Perhaps you will like this “game” which allows you to fool the spying person. To login to the secure platform, click on the button with the program’s logo and the inscription: “Login to the secure platform”. Any information will not appear in the logs of spyware after work inside the platform. And traditionally, we checked the spy process vsmon.exe using 39 antivirus engines on the famous online service. Three anti-virus from the 39 considered it as a threat. This is fairly standard and predictable statistics. The specialists of our laboratory have rated Total Spy not very high – RLM: 3 / 1 / 0. 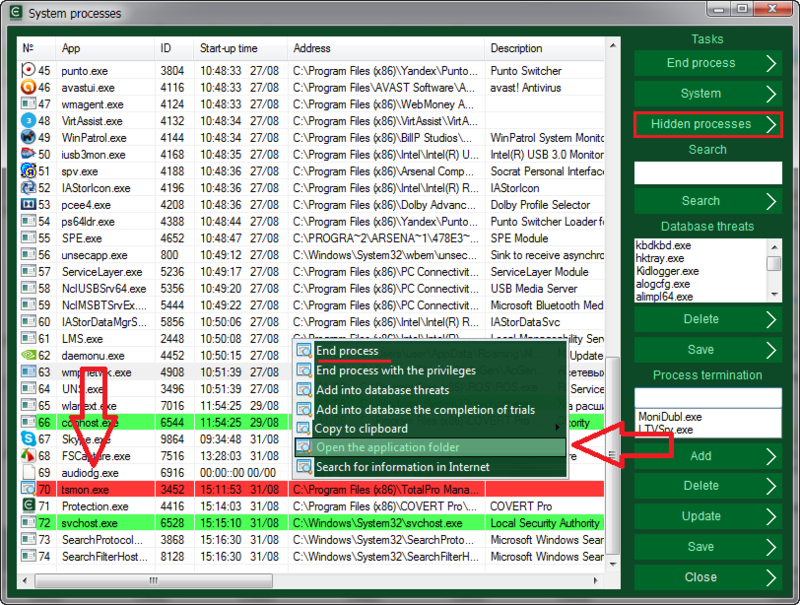 The program has only basic keylogger functionality, it can be easily detected and removed.